The campaign signs have begun to appear for Central’s November elections, but what does that have to do with Central’s 2018 graduating seniors? Simple: this is an ideal time to step back and consider what legacy we are leaving to this next generation of citizens of Central. It is also the time to ask our current and future elected officials to listen to what the citizens of Central want that legacy to be. 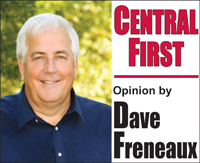 As we put together this Graduation Edition of Central Speaks, I was reminded that the decisions made today that affect drainage, finances, and overdevelopment will have long term effects on Central’s future. Those decisions are being made by our current elected officials, and will be either continued or corrected by those elected this November. All of us either stayed in Central or moved to Central because of what this community is, not for what it might some day become. Central has always enjoyed a quiet rural lifestyle, excellent schools, and modest traffic. More recently Central voted to become a city. Through privatization Central is financially sound, and through the Master Planning process Central has charted a course to reasonable and sustainable growth. Those who came before us gave us this quiet rural community and excellent schools, and taught us financial responsibility, placing needs before wants and being prepared for the future. My wish is that we do the same for those who follow us. Central’s lifestyle and schools were major factors in the development of the Master Plan. Let’s stick with that plan and give the next generations a quiet community without school overcrowding and excessive traffic problems. The city has built up cash reserves to be able to weather the storms that come our way. After the flood of 2016 the city faced a $10 million cleanup and had the cash reserves to make that happen until FEMA reimbursed 90% of those costs. Let’s plan carefully how we choose to spend those resources, always putting needs before wants, so that we leave a financially sound city to these 2018 graduates. Finally, let’s fix our drainage. There should be no higher priority than to complete the comprehensive drainage study, make a plan for upgrading and repairing drainage infrastructure, and put a solution in place to fund that plan. I would love to build a reasonably-sized City Hall in a well-planned City Center for future generations to enjoy, but let’s first invest in drainage to protect all of our homes, including the homes our 2018 graduates and all those who follow them.